In the desert, on safari, up a mountain or simply on the move, the solargorilla portable solar charger gives your powergorilla juice anywhere under the sun. 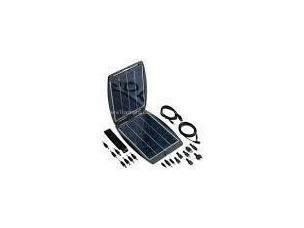 solargorilla is also a viable charging option for laptops under 40 watts and it can even charge your mobile phone, iPod, handheld games consoles and many more devices from the 5V USB output. solargorilla works via two PV (photovoltaic) solar panels, which generate electric current when they are exposed to sunlight. The solar panels are made of glass which greatly improves the performance of the solargorilla as well as making the aesthetics of the unit better. The Red LED on the solargorilla indicates the strength of charge - the more UV intensity - the better it will work! 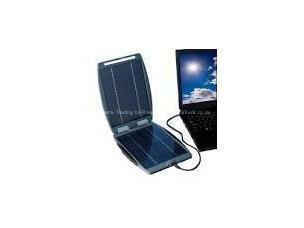 The technically advanced solar panels ensure superb power and reliable performance, all housed in a tough outer casing.